Environmental Incompatibility to freezing Tempuratures without the proper protection causes a +1 modifier to all difficulties (which increases by +1 per minute exposed) until the character is out of the harmful situation. The character is an outsider to the “mainstream” culture of the society he spends the most time in. The player should decide on the character’s native planet, which is somewhere with a different culture than the one he is normally in. Alternatively, he could be an android who hasn’t been programmed with all of the correct social skills. Bigots might get in the way of the character, and the character might not always “know” things about the setting that natives would automatically understand. +9 to the Difficulty of Streetwise and other Getting around Town Skills. This character grows older quicker. They live for an average of 40 years, reaching sexual maturity at 2 to 3 years of age. They reach their physical climax at age 6 and begin to slowly fade in strength and stamina at age 40. 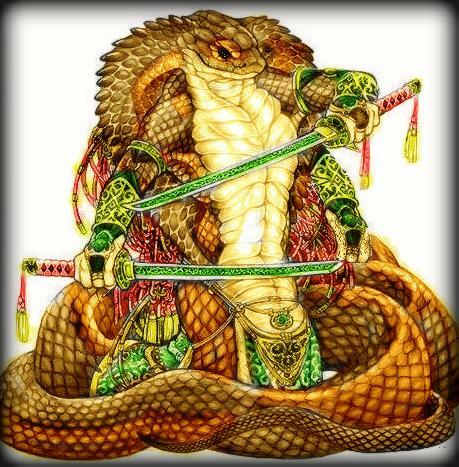 A Naga is considered elderly (and incapable of certain physical actives) when they reach their 50’s. When the character reaches Forty, add a +1 difficulty modifier to all physical actions. applies to specializations. There should be some sort of reason for this in the character’s background, such as a difficulty reading or a lack of education. Restrictions/Notes: This is the counterpart to the Quick Study Special Ability, and it should be treated in much the same way. This Disadvantage can be taken multiple times, either for the same attribute (with a cumulative increase in skill cost) or for different attributes. The character gains the ability to see in the dark using infravision, a form of heat orientated vision which allows them to see in the dark. The ability provides a +2 in sight based rolls while in dim or dark conditions. The character can sense danger. She is never surprised. Rather, she and her attacker must determine initiative as normal. Even if the attacker still goes before the character does, any combat modifier from the surprise is reduced by 2. A character may not have this ability more than once. The character has great endurance, and gains a +3D per rank to Strength or stamina checks when performing taxing physical tasks (such as holding one’s breath underwater for a long period or running a long distance). Scales: The character can take damage better than normal. They add +1 to damage resistance rolls. The character is equally adept with her right or left hand. She may perform an action with each hand in the same round, and, though she takes the multi-action penalty, she receives a +1 per rank to each skill total. The actions must involve the hands and each action must require only one hand. If the character performs only one hand-related action in a round, she does not get the bonus. Some skills that characters could employ with either hand include brawling, sleight of hand, firearms, throwing, lift, artist, forgery, and the map-making aspect of navigation, though, of course, not every task covered by each skill is relevant. A character may take multiple ranks of this Special Ability for two pairs of hands and multiple ranks for each additional manipulative limb. The character has some sort of natural weapon — such as claws, pincers, bone spikes, or stinger — that add 1D per rank to his Strength Damage when determining his damage with the natural weapon. The character uses brawling to attack, unless he can detach the weapon from himself or (in the case of a super-scientific weapon) its exists separately. In these latter cases, the character employs melee combat to wield it.